The branch must be fully merged in HEAD. But what is Git HEAD exactly? You can think of the HEAD as the "current branch". When you switch branches with git checkout, the HEAD revision changes to point to the tip of the new branch. A head is simply a reference to a commit object. Each head has a name (branch name or tag name, etc). By default, there is a head in every repository called master. A repository can contain any number of heads. At any given time, one head is selected as the “current head.” This head is aliased to HEAD, always in capitals". Note this difference: a “head” (lowercase) refers to any one of the named heads in the repository; “HEAD” (uppercase) refers exclusively to the currently active head. This distinction is used frequently in Git documentation. Another good source that quickly covers the inner workings of git (and therefor a better understanding of heads/HEAD) can be found here. References (ref:) or heads or branches can be considered like post-it notes stuck onto commits in the commit history. Usually they point to the tip of series of commits, but they can be moved around with git checkout or git reset etc. Head is your current branch. It is a symbolic reference. It is a reference to a branch. You always have HEAD, but HEAD will be pointing to one of these other pointers, to one of the branches that you're on. It is the parent of your next commit. It is what should be what was last checked-out into your working directory... This is the last known state of what your working directory was. The whole video will give a fair introduction to the whole git system so I also recommend you to watch it all if have the time to. HEAD is just a special pointer that points to the local branch you’re currently on. How does Git know what branch you’re currently on? It keeps a special pointer called HEAD. Note that this is a lot different than the concept of HEAD in other VCSs you may be used to, such as Subversion or CVS. In Git, this is a pointer to the local branch you’re currently on. In this case, you’re still on master. The git branch command only created a new branch — it didn’t switch to that branch. HEAD always refers to the most recent commit on the current branch. When you change branches, HEAD is updated to refer to the new branch’s latest commit. HEAD is the "tip" of the current branch. Note that we can use HEAD to refer to the most recent commit, and use HEAD~ as the commit before the tip, and HEAD~~ or HEAD~2 as the commit even earlier, and so forth. HEAD names the commit on which you based the changes in the working tree. Instead of typing "HEAD", you can say "@" instead, e.g. "git log @". Stack Overflow user VonC also found some interesting information on why @ was chosen as a shorthand in his answer to another question. Also of interest, in some environments it's not necessary to capitalize HEAD, specifically in operating systems that use case-insensitive file systems, specifically Windows and OS X. In this repository, the contents of the HEAD file refers to a second file named refs/heads/master. The file refs/heads/master contains the hash of the most recent commit on the master branch. The result is HEAD points to the master branch commit from the .git/refs/heads/master file. the branch itself is defined as all points reachable in the commit graph from the named commit (the “tip” of the branch). As Greg mentioned, HEAD can be in a "detached state". So HEAD can be either a simple ref (for a detached HEAD) or a symref. if HEAD is a symbolic ref for an existing branch, then you are “on” that branch. If, on the other hand, HEAD is a simple ref directly naming a commit by its SHA-1 ID, then you are not “on” any branch, but rather in “detached HEAD” mode, which happens when you check out some earlier commit to examine. I think 'HEAD' is current check out commit. In other words 'HEAD' points to the commit that is currently checked out. If you have just cloned and not checked out I don't know what it points to, probably some invalid location. Head points to the tip of the currently checked out branch. 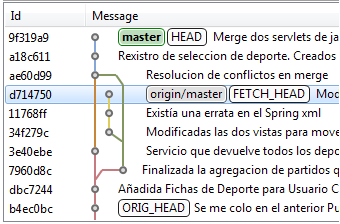 A great way to drive home the point made in the correct answers is to run git reflog HEAD, you get a history of all of the places HEAD has pointed. The HEAD in Git is the pointer to the current branch reference, which is in turn a pointer to the last commit you made or the last commit that was checked out into your working directory. That also means it will be the parent of the next commit you do. It's generally simplest to think of it as HEAD is the snapshot of your last commit. There is a, perhaps subtle, but important misconception in a number these answers. I thought I'd add my answer to clear it up. HEADis a symbolic reference pointing to wherever you are in your commit history. It follows you wherever you go, whatever you do, like a shadow. If you make a commit, HEAD will move. If you checkout something, HEAD will move. Whatever you do, if you have moved somewhere new in your commit history, HEAD has moved along with you. To address one common misconception: you cannot detach yourself from HEAD. That is not what a detached HEAD state is. If you ever find yourself thinking: "oh no, i'm in detached HEAD state! I've lost my HEAD!" Remember, it's your HEAD. HEAD is you. You haven't detached from the HEAD, you and your HEAD have detached from something else. What can HEAD attach to? HEAD can point to a commit, yes, but typically it does not. Let me say that again. Typically HEAD does not point to a commit. It points to a branch reference. It is attached to that branch, and when you do certain things (e.g., commit or reset), the attached branch will move along with HEAD. You can see what it is pointing to by looking under the hood. That's what happens when HEAD points directly to a commit. This is called a detached HEAD, because HEAD is pointing to something other than a branch reference. If you make a commit in this state, master, no longer being attached to HEAD, will no longer move along with you. It does not matter where that commit is. You could be on the same commit as your master branch, but if HEAD is pointing to the commit rather than the branch, it is detached and a new commit will not be associated with a branch reference. You can look at this graphically if you try the following exercise. From a git repository, run this. You'll get something slightly different, but they key bits will be there. When it is time to checkout the commit directly, just use whatever abbreviated hash you get from the first output (here it is a3c485d). OK, so there is a small difference in the output here. Checking out the commit directly (instead of the branch) gives us a comma instead of an arrow. What do you think, are we in a detached HEAD state? HEAD is still referring to a specific revision that is associated with a branch name. We're still on the master branch, aren't we? Nope. We're in 'detached HEAD' state. 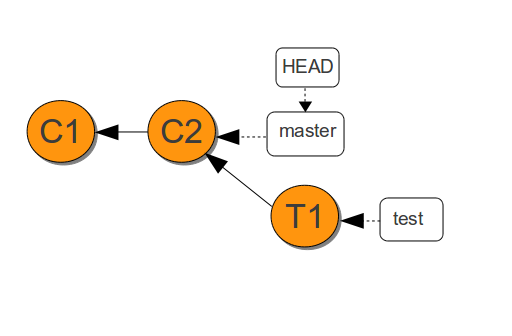 You can see the same representation of (HEAD -> branch) vs. (HEAD, branch) with git log -1. HEAD is you. It points to whatever you checked out, wherever you are. Typically that is not a commit, it is a branch. If HEAD does point to a commit (or tag), even if it's the same commit (or tag) that a branch also points to, you (and HEAD) have been detached from that branch. Since you don't have a branch attached to you, the branch won't follow along with you as you make new commits. HEAD, however, will. It feels like that HEAD is just a tag for the last commit that you checked out. Pointing to named references a branch recently submitted. Unless you use the package reference , heads typically stored in $ GIT_DIR/refs/heads/. 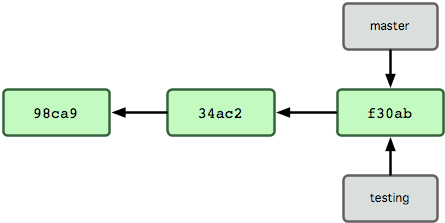 Current branch, or your working tree is usually generated from the tree HEAD is pointing to. HEAD must point to a head, except you are using a detached HEAD. Figure 3-5. HEAD file pointing to the branch you’re on. In addition to all definitions, the thing that stuck in my mind was, when you make a commit, GIT creates a commit object within the repository. Commit objects should have a parent ( or multiple parents if it is a merge commit). Now, how does git know the parent of the current commit? So HEAD is a pointer to the (reference of the) last commit which will become the parent of the current commit. As a concept, the head is the latest revision in a branch. If you have more than one head per named branch you probably created it when doing local commits without merging, effectively creating an unnamed branch. To have a "clean" repository, you should have one head per named branch and always merge to a named branch after you worked locally. This is also true for Mercurial. 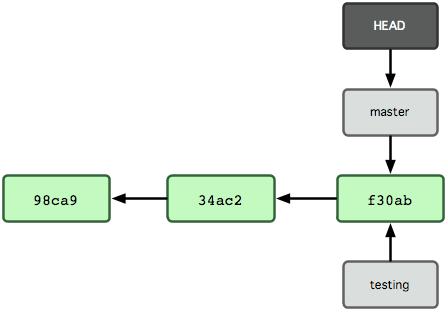 What's the difference between git reset --mixed, --soft, and --hard? What does the “at” @ sign/symbol/character mean in Git?